Hey Guild members! It’s Monday again. We’ll start this week by talking important issues today at Ilmastovalmennus and this Wednesday this years first Kiltapäiväkerho is held, where the subject is Training of the Guilds Officials, see you guys there! Apply to Aalto Fellows 2018! DL 31.1. Apply to be a part of the Guild’s Wellbeing team! DL 31.1. “On Photography” Lecture Series with nabbteeri artist duo 31.1. The Guild of Architecture invited the climate change specialist Leo Stranius to give climate training on 28.1. at 16:00 in Otakaari 1, room A2. The lecture will be held in Finnish. you are warmly invited to a talk by artist duo nabbteeri on Thursday, 31st of January at 15.15, Väre, room F101 (by the main entrance). The talk is part of On Photography lecture series and is organised in conjunction with Photography workshop: On Circulation (Master’s Programme in Photography, Department of Media). nabbteeri is an artist duo formed in 2008 by Finnish artists Janne Nabb (b. 1984) and Maria Teeri (b. 1985), whose practice is characterised by the preconditions of working in changing locations. Their polymorphic works are compositions based on somewhat messy interactions and fusions between the artists and other things. Alongside of borrowed, recycled and remodelled surplus materials and objects, nabbteeri’s stratified, mesh-like works can include elements created with 3D modelling or other digital technologies. These often ephemeral works change their form throughout long processes. In 2019 together with artists from Sweden and Norway nabbteeri will participate in Nordic Pavillion of the 58th International Art Exhibition Venice Biennale. It is time to act to be part of the triennal WOOD 2019! We invite students in architecture to design pavilions in the area around the art gallery. The pavilions should be designed as open meeting places, shelters from wind, sunshine and rain, but open and accessible for everyone. * Registration for participating should be made to info@virserumskonsthall.com<mailto:info@virserumskonsthall.com> on 1st March 2019 at the latest. * The party participating can be a group of students, or a class or course. * The project to be entered should be authorized by the tutor of the party. * Plan/rendering of the pavilion should be sent to the above email-address before 15th April 2019. A description of construction material, quantities needed, tools and machinery should also be submitted as well as the notion behind the pavilion. 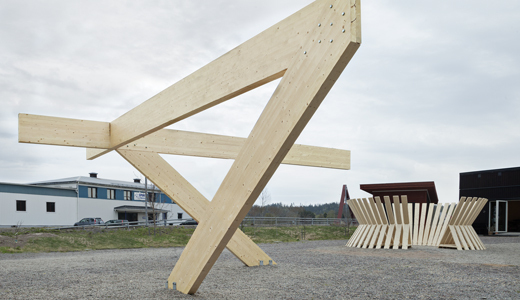 * The pavilion should be designed in wood from Swedish forests or some other renewable source. It should be no larger than 5 m by 5 m and the maximum height 3,5 m.
* The pavilion should be designed for a ten year lifespan with only minor maintenance. * Virserum Konsthall will choose three designs to be carried out. * The parties that designed the designs to be carried out can build their pavilions on site in June 2019. Virserum Konsthall will pay for construction material, tools and machinery. The parties will get an allowance of € 3500 for each party for travels and hotel. Pavilions not build by their designers wil be build by Virserum Konsthall. * All projects chosen will be awarded € 1000. For more information, please contact Barbro Wenden, barbro.wenden@virserumskonsthall.com<mailto:mail%20to:barbro.wenden@virserumskonsthall.com> or +46 49531580. Student projects 2013 by The Royal Danish Academy of Fine Arts, School of Architecture.